After the dark long winter we have been through in North America we could all do with some much needed colour. 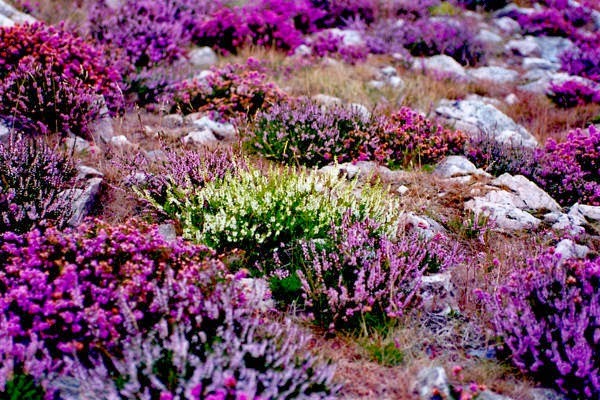 The photo above is some very Beautiful heather found in the British Isles. I don't know about you but that colour makes me smile & my Spirit Soar ! And here is the Shetland Heather lacy glove kit that is a Warm welcome on a fresh Spring morning ! Knit circular on 3.5mm's with all over lace stitches that add such a feminine touch to the open fingered gloves. 100% Organic Shetland wool is light & airy & Perfect for all seasons. There is something very comforting about pure organic wool yarn & Knitwear that you DO NOT get with crappy Acrylics. Crappy Acrylics are just a waste of knitting time. In no time at all knitwear looks shabby... like its been to hell & back so what do you do....put it in the garbage....more crappy land fill ! 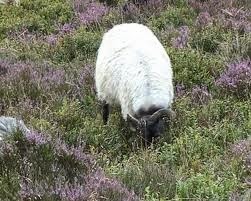 Wool on the other hand is well worth your knitting time & Healthier for you & the Environment. Garments look good for years, they last (almost) forever ! choosing at Random 2 winners to knit the Shetland Heather Glove Kit. It's heavenly soft to the touch & After blocking all those lovely yo's will spread. I plan on knitting this as large as possible so it's gonna take a while ! To enter simply tell me your Favourite thing about SPRING TIME ! 2 winners drawn at random, open to knitters world wide. Enjoy the Spring Time ! I'm a spring baby, so it's my favorite time of year. Seeing all the brown go away and all the fresh, new life coming back gives me a jolt that is desperately needed after a long, cold winter (especially after this year). In spring I do not have to wear multiple layers of clothes to stay warm. I love warmth .In spring no more wood heat to take care of. My favorite thing about Spring is the flowers--the hyacinths, tulips, daffodils and crocuses. Hmm, so many things to choose from... I'd go with maple syrup making, and all the tastes and smells that go with a day at the sugar shack! My favorite thing is the bird songs. Only when they star to sing again after the winter, I realize just how much I missed their sounds. Thank you for the chance! I, too, love hearing the birds and seeing the flowers start to emerge. But the sunshine!! I no longer have to turn on the lights in the kitchen to make dinner and I love it! Seeing my crocus and hyacinth bloom. Then I can believe it's actually Spring. My favorite thing about spring is the weather..
For me, the best thing is finally getting back out into the garden -- if I can't garden, I curl up and die inside, so Spring is even more of a blessing than Winter is a hardship. Although I have houseplants to help me hang on, it's just not the same. Hearing the little spring peeper frogs, and seeing the wood ducks in the trees!! Only in spring time do I get to see the ducks in the trees!! I love all the blooms from the flowers and trees. My favorite thing about spring are the wildflowers we encounter on our wanderings through our beloved trails and parks. I love the colors in Spring after the dark winter. My favorite thing about spring time is the regeneration and renewal of our home. My favorite things about spring are all the flowers and flowering trees popping out at different times. I think what great yarn colors they would make. Definitely the crocuses-- they're the first thing to come out around here. I like all the baby birds. I love the forsythia blooming in spring. In northern virginia we have plenty of forsythia bushes and every year I enjoy their yellow blooms. Daffodils. A reminder of hope for those who fight bravely against cancer. The thing I like most about spring is being able to get out with the grandchildren for walks and there are no bugs yet. I know that this is short lived but I enjoy that the most, getting outside in the fresh air and enjoying the day. Thanks for the opportunity in this contest would love to win. OMG, love the nail polish in the first pic! My fave thing about spring is the flowers and warm sun after a long miserable Michigan winter! What I love most about spring is that it brings hope for a warm and glorious summer :) Love that purple! That DEFINITELY gives me hope!! Over the years it Top Evening Shawl has been possible to bring into play so many different factors that can help in securing the Best Wool Shawl ranges of sarees and fabric that has come over the years. This is mainly because of the range of products and other fabrics Online Designer Shawl that are available with the items so that this piece can put light in such races and help get a Pashmina Shawl good design.